After nearly a decade as a sous-chef in a trendy eatery, Jenna is desperate for a change. She’s supported her ex-husband’s dreams for so long that she can’t even remember her own. Until she sees a for-lease sign near her parents’ home and envisions her very own cooking store. Her crash course in business is aided by a streetwise store manager and Jenna’s adoptive mother. But just as she’s gaining a foothold in her new life, in walk her birth parents — aging hippies on a quest to reconnect with their firstborn. For years, Jenna has lived the city life. She was married, worked in a restaurant by her husband's side, and was doing well. Or was she? Her marriage crumbled,leading into Jenna rethinking her life and her dreams. What did she really want? Was she really living our her dreams? What does one do when she realizes she needs something different? Well, go home, of course. On a whim, she starts her own business. But Jenna's going to need a lot of help to keep up with her new store. Enter Violet, a woman who dresses different and is unsure of things. Having a dark past that haunts her to this day, Violet is a loner, but has the experience and skills necessary to help Jenna run her store. After a hesitant start, the two become friends and rely on each other to keep afloat. Violet helps Jenna rethink her business strategy when it shows that Jenna has no idea how she wants to run her store. And when a love interest enters Violet's life, she turns to Jenna for advice on what to wear on her date. As Jenna's new life and business fall into place, who should come into her life unexpectedly? Her birth parents. What a complete surprise to Jenna and her adoptive parents. Beth, Jenna's adoptive mother stays supportive and encouraging to Jenna to get to know the strangers that gave her up all those years ago. Susan Mallery creates an emotional story that stretches the boundaries of relationships. She tests all relationships in this story - between mothers and daughters, friends, strangers, and significant others. Her well thought out characters are so believable and engaging the reader can't help but smile, laugh and cry at the situations each one faces. The story is full of conflict and decisions, and questions. Jenna is torn between her feelings and how to react now that her birth mother swiftly enters her life, and how will that affect her relationship with Beth, the woman who has raised Jenna as her own and given her a wonderful life? How does Beth really feel, even though she's encouraging Jenna to get to know her parents? What brought them here now, instead of when Jenna was younger? 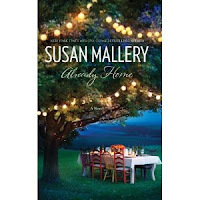 I know when I pick up a book with Susan Mallery's name on it that I'm in for a heartwarming, emotional, pleasurable read. Already Home was no different. She weaves the the plot and subplot in so wonderfully and long after the last page is read, her stories and characters stay with me in my mind. Her books are a keeper and can be enjoyed after the first, second, and hundredth time reading. If you enjoy a contemporary story full of heart and love, then you'll feel like your right at home with this book.